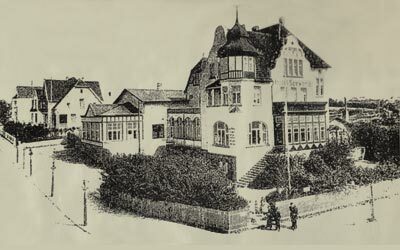 The guesthouse Seewarte in Flensburg looks back on an eventful past. In the following you can find out more about our tradition-filled hotel, which was built in 1906 and is in the possession of the Luig family since 1955. In the course of settlement and enlargement of the naval armed forces by emperor Wilhelm II in Flensburg-Mürwik, Seewarte was built. It served as getaway pub and hotel for army officers and their families. 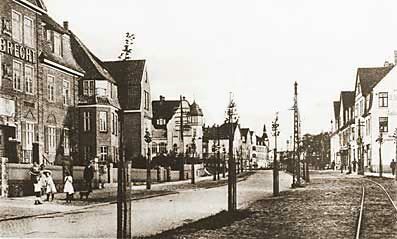 The picture shows the Mürwiker Straße (Mürwiker street) in 1914. Around 1911 the tram was laid up to the newly built navel college Mürwik. It was named after emperor Wilhelm II. In 1945 she got today’s name. 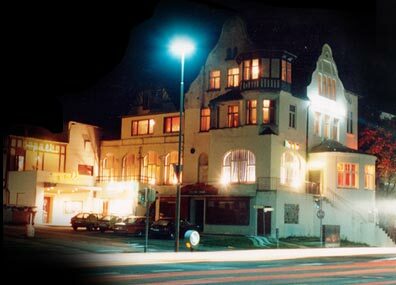 The picture shows the hotel Seewarte at night in 1978. The hotel hosts the cinema “Pali”. It was one of the first cinemas with consumption in the republic. After the film you could enjoy the “best curried sausage in the entire world” at the “Super-Grill” (News coverage of NDR, Sat1). 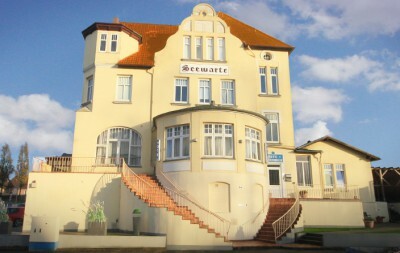 On the upper floors the club “Queen Mary” was located, where marines would come to “schwofen” (colloquial German for “to party”) in their second homeland each night. After the Fall of the German Wall and the corresponding withdrawal, Flensburg changed. Today Flensburg puts emphasis on tourism and college students. The Seewarte also had to realign and since then focused more on tourism as well. 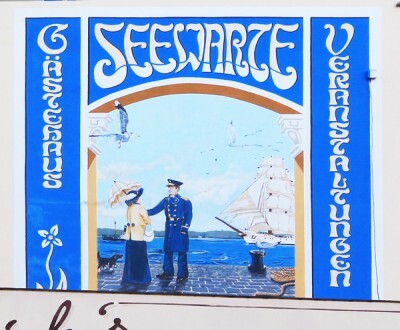 The guesthouse Seewarte is one of the few “originals of Flensburg” which you can feel, once you visit. Despite many refurbishments and additions the historical building has not lost its charm. 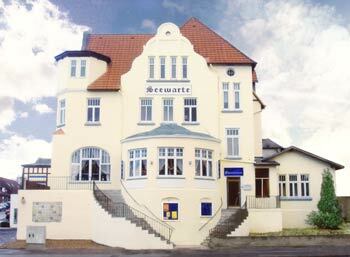 Today the Seewarte Flensburg offers 11 nicely furbished single and double rooms with cable TV and its own bathroom. By request, a refrigerator and wireless internet (WLAN) can be added to your booking. 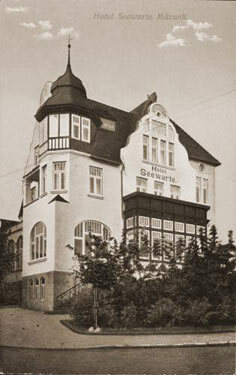 If you like to know more about the history of the hotel, feel free to ask to the Luig family. It might even happen, that you while at breakfast in the erstwhile room, where some naval officer has already found his happiness, will become a time traveler through Flensburg’s history, too. An army officer says good bye to his lady and sets sail with the sail drill ship “Gorch Fock”. Every naval officer, in emperor’s times until today, had to complete part of their training at the naval college Mürwik and the sail drill ship Gorch Fock. 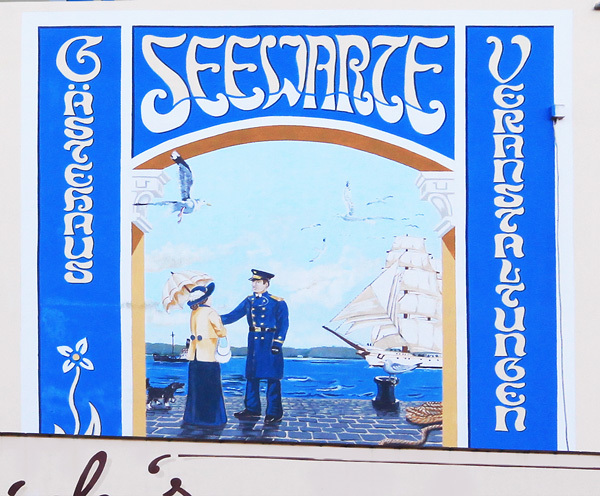 The Austrian artist Hannes Forstner has chosen this theme to underline Flensburg’s naval tradition. The theme of this picture was chosen by Hannes Forstner according to the preferences of Flensburg’s inhabitants. 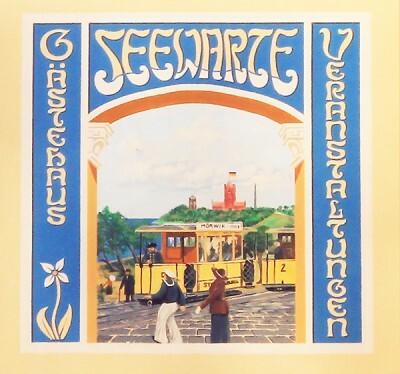 It shows the tram station “Seewarte”, which the Flensburg’s inhabitants miss until today. In the background, the naval college Mürwik, the “Mäuseturm” and the smoke stack of the old brick manufacture can be seen. Heinrichs Classic Bar wird Since 2008 Heinrichs Classic Bar is run by the junior manager of the house. Since 2011 she belongs to the best bars of Switzerland, Austria and Germany (Source: Mixology). Do you crave a delicious burger? 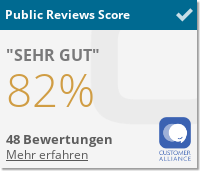 Then we recommend you a visit at Bastians Currywurst & Meer, where the homemade burgers in our hotels are offered since 2013. Do you want to be part of the history of the impressive hotel in the heart of Flensburg, which is filled with charm and personality? Then don’t wait to have a look at our guestrooms and place a booking request through our contact form.